Grinding teeth at night can be painful and cause an array of dental problems. This is often caused by a sleep-related movement disorder known as sleep bruxism. This causes you to clench, grind, or gnash your teeth in your sleep. This can damage enamel, cause tooth fractures or chips, or even cause pain in your jaw, neck, and face. So, what can you do to reduce this problem? One of the most popular products used as a solution for sleep bruxism is a night guard. 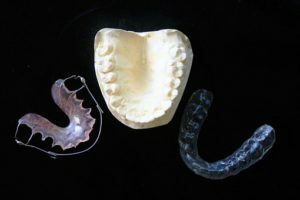 These are typically custom fitted to work for your specific mouth shape and made from either acrylic or plastic. It will prevent your teeth from rubbing together while you sleep. It fits over your teeth and you wear it overnight. While it won’t stop you from grinding your teeth, it will help you prevent damage to your teeth that this habit causes. While there isn’t one pinpointed a cause for sleep bruxism, stress can be a major factor. So, it’s worthwhile to take measures to reduce your stress levels. There are a few ways you can do this. After all, stress reduction can be different from person to person. For one, you could try to take some time before bed to do something calming like reading your favorite book. Another idea would be to take the time to work up a sweat during the day. Exercise is a great natural way to lower stress levels also you can try some yoga poses for stress relief. If your bruxism is sourced in severe anxiety, it can be helpful to seek out a professional. They’ll be able to help you learn coping mechanisms that work for your situation specifically. As you learn healthy techniques to calm down, you can reduce behaviors related to anxiety such as grinding your teeth. Another way to reduce grinding is to avoid certain food and drinks. For example, caffeine can be a real problem. Of course, there are obvious sources of caffeine that you know to cut down on such as sodas and coffee. However, you’ll want to remember that foods such as chocolate are also sources of caffeine. In addition to caffeine, you’ll want to avoid drinking alcohol. This can increase your nighttime tooth grinding. As mentioned earlier, there’s more to grinding your teeth than just your teeth. The teeth grinding from sleep bruxism is mainly sourced in tension in your jaw. Luckily, there are steps you can take to relax your muscles before you go to bed. Some like to tend to warm baths because this can both relax muscles and relieve some of the stress of the day. If this isn’t something you’re interested in, though, you aren’t out of luck. Use a warm, damp washcloth or heating pad each night and hold it against your jaw right in front of your ear for a few minutes before you go to bed to loosen these muscles up. This works because heat increases blood flow in the area of the body it’s applied to. On top of this, you can massage your jaw to decrease tension. Just like any other sore muscle in your body, this can relax knots and leave those muscles more relaxed. Grinding your teeth can also come from bad habits. There are a lot of reasons that grinding your teeth during the day can become a habit from anxiety to stress and more. After a while, it becomes a subconscious habit – you may not realize you’re doing it. To start decreasing this behavior try to pay attention to when you’re doing it. Make a conscious effort to relax your mouth and jaw – don’t put your teeth together when you close your lips. As you try to quit the habit during the day, the less likely you are to do the habit at night. Grinding your teeth can be more than just a bad habit. It can cause you to damage your teeth and even leave you with aches and pains in your jaw and neck. By keeping tips like these in mind, you can find relief from your sleep bruxism. This write-up was contributed to Credihealth by Annabelle Carter. Annabelle Carter Short writes for several health publications with a specific interest in brain health. She also works with few organizations to provide families with the best resources for raising and educating a child with ASD. When not working, she’s spending time with her family or putting pen to paper for her own personal pursuits. Annabelle is a mother and she loves sewing and making crafts with her children.